NYCFC 2 - 0 LA Galaxy. Sean Johnson's cleansheet dominates the struggling Galaxy. August 13, 2017 By Chris P.
The night started well for New York City FC as Chicago’s loss to Columbus gave them an opportunity to move into second place in the Eastern Conference with a win. The LA Galaxy came into the game in 9th place in the West with their only win at home this season coming back on April 8th against Montreal. NYCFC had to field a lineup without Maxi Moralez who was suspended on yellow card accumulation. 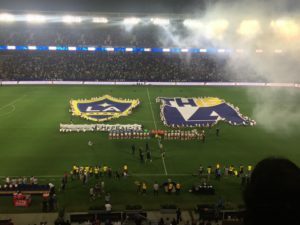 LA had to deal with their best defender Jelle Van Damme suspended and Giovanni Dos Santos out with a hamstring injury, his brother and recent acquisition Jonathan Dos Santos did get the start. The game got off to an electric start with a very vocal crowd at the StubHub Center. Yangel Herrera was one of the most impressive players in the first half. Stealing the ball from Jonathan Dos Santos in a remarkable show of skill early on, which he complemented with great one touch passing and dribbling. The man who had drawn interest from Lyon was putting on a show for any interested suitors. Scouts weren’t the only ones watching Veteran Jermaine Jones also had his eyes on the Herrera, putting in a tough two footed tackle on the Venezuelan midfielder in the 34th minute. Herrera’s impressive form was one to watch but the first half belonged to NYCFC’s goal keeper. It was a tough back and forth game on the pitch but the LA Galaxy dominated the chances. NYC didn’t get a single shot on target in the first half. The dynamic of the game changed in the 54th minute when Jonathan Lewis picked up the ball in midfield, ran 30 years and fired in a curler from outside the box that chipped Rowe and bounced off the keeper and into the back of the net. New York City’s first shot on goal was perfection. Lewis was pulled off for Khiry Shelton in the 62nd minute, with the goal scorer coming off to loud cheers from the traveling NYCFC supporters. Not to be outdone by the rookie, David Villa fired home his 18th goal of the season in a manner only David Villa could. The story of the game however was the impeccable form of Sean Johnson. He quite literally singlehandedly kept NYCFC in the game with save after save in the first half. It was no different in the second half, just seconds after the whistle to start off the half Johnson came up with a big save on Emmanuel Boateng. Where LA Galaxy keeper Rowe managed to put in a fine shift where he was only beat by spectacular plays, Sean Johnson was able to pull off seemingly superhuman efforts to stop every single attempt. The man who was on the U.S. National Team’s roster in the Gold Cup in the group stages but failed to see the field put on a clinic right outside of U.S. Soccer’s training facility here in Los Angeles County. “My job is to go out and give everything I got. I know Bruce [Arena] and those guys are always watching games so it feels good to play well in this one but I have to keep it going” said Johnson about a possible call up. Undoubtedly LA were frustrated by their, at times comical inability to find the back of the net. With this win NYCFC moved into second place in the east, just four points behind leaders Toronto FC. The LA Galaxy continue their downward spiral, they have failed to win a game at home in months.